Global table linens that give your table international flair. A colorfully stitched border lends these napkins a touch of charm that's just right for long weekend brunches. Glass beaded placemat with matching cotton fabric lining. 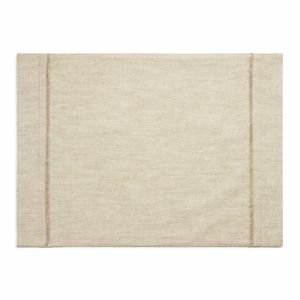 With textured edges and a subtle grid motif, these napkins lend a sense of casual elegance to any meal. Cotton Add the cool luxury of cotton and linen to your table setting with Hotel Collection's Overlock Edge napkin set, each in a natural tone, edged in white, that's suitable for both casual dining and entertaining. We love the natural, textured materials of this piece - it's an inspired way to bring a hint of the outside indoors, and the neutral tones ensure it matches with any collection of table settings. 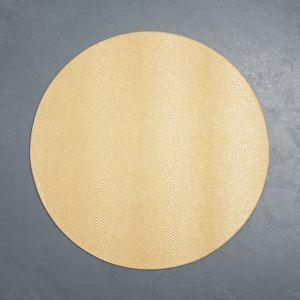 Add coastal ambiance to casual dining and entertaining, indoors or out, with the textured spiral design of The Cellar's Round Rope placemat. 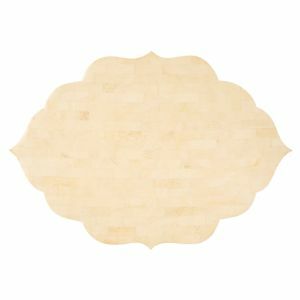 Resin Placemats created with hand-layered capiz shells; cork backing protects tabletops. The smart woven linen designs in the Hotel Collection Modern table linens collection travel from dining room to breakfast nook to patio with ease. Sophisticated in a sleek, gray linen, these napkins from the Hotel Collection are a versatile accent to everyday dining and dinner parties. The smart woven linen designs in the Hotel Collection Modern table linens collection travel from dining room to breakfast nook to patio with ease. Bring casual charm to your dining table with the Sydney Placemat Collection from Bardwil. Fashioned of heavyweight looped cotton coils, the collection's chic macramé-style designs complement vintage and farmhouse-style settings. Accent your table setting with the vintage vibe of Bardwil's Le Jardin napkin, featuring a beautiful floral print on a textured ivory ground. Accent your table setting with the vintage vibe exuded by a beautiful floral print on the textured ivory ground of Bardwil's Le Jardin placemat. Totally textured, the Bardwil Otis reed placemat weaves an air of inviting casual flair into your tablescape while also doubling as a charger. A rustic-yet-refined plaid design on the drop of Bardwil's French Picnic tablecloth captures a countryside mood that's made for easy care. Bring a rustic touch to your table with the crocheted macrame style that radiates around Bardwil's Milla placemat. Beautiful indigo embroidery enhances the linen-colored texture of the Bardwil Cerelia table linen collection to add inviting elements to a tablescape. Bring a timely tone to your tablescape with the fresh floral shades of the Bardwil Calendre table linen collection Add sophisticated dimension to your table with the unique texture of this on-trend tablecloth from Bardwil's Continental Collection. These beautiful solid colors are able to bring life to any table setting for any casual event. Collection includes a variety of tablecloth sizes, placemats, napkins, and runners. Easy care and machine washable makes for minimal effort when cleaning. Available in a variety of hues to coordinate with any kitchen or dining room. From Bardwil. Refresh your tablescape with the Bardwil Lemons Table Linens collection, boasting yellow fruits and green leaves on easy-care polyester in a vibrant pattern ideal for indoor and outdoor dining. Add sophisticated dimension to your table with the unique texture of this crisp, minimalist white tablecloth from Bardwil's Continental Collection. Set the stage for elegant dining with the Bardwil Continental Mulberry Table Linens Collection. Its modern pattern, combined with its regal hue, brings distinctive style to casual or formal tablescapes in a variety of easy-care tablecloth sizes as well as placemats and napkins. Add dimension to your table with the unique texture of this traditional taupe tablecloth from Bardwil's Continental Collection. Touches of texture in versatile tones enhance the sophisticated simplicity of the Bardwil Continental Cream table linen collection. Add dimension to your table with the unique texture of this sleek gray tablecloth from Bardwil's Continental Collection.